Hello Friends, and welcome back to another edition of one of my favorite series — Disney in Pictures! As you probably know by now, Disney in Pictures is theme based, with a new theme being announced midweek — usually Wednesday or Thursday! The beauty of this, for me, though, is that I have opened up the picture sharing to all of you, my fellow fans of Disney, and I have had so much fun each week sharing your photos for all of us to enjoy! This week’s theme is “Favorite Restaurants!” — and if there is one thing I know, it’s that we all have our favorite Disney restaurants! So sit back and enjoy this photographic journey across some of our favorite eateries! First up on my list are a couple of photos from restaurants that used to be character meals, but are no longer. The first one is of the Liberty Tree Tavern, taken back on Sophie’s birthday, June 19, 2008, when we had her best friend join us for the day at the Magic Kingdom. Enjoy! 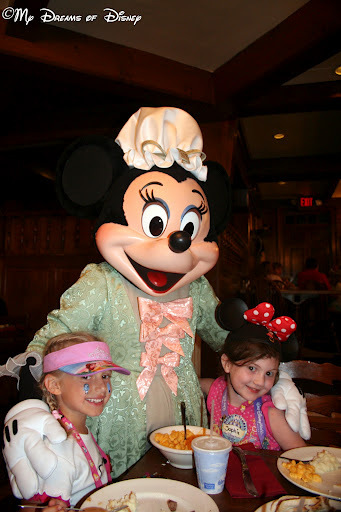 This next picture is of Sophie and Goofy taken at Restaurantasaurus, back in 2007. Restaurantasaurus is now a counter service restaurant, so this is a special photo for me. This is Melissa (your fellow Mouze Kateerz). I am attaching a couple of pictures of my family’s favorite dinner show at Disney – The Hoop de Doo Revue. This show is a must-do for our family on every trip and while the show hasn’t changed much over the years it never fails to have us rolling in the aisles.The food is great and bountiful. There never seems to be enough fried chicken to feed us all, good thing that there doesn’t seem to be a bottom to the bucket. Yes, bucket! Dinner is brought to you in serving pails. No matter how many times my kids see this they still giggle at the sight of a dinner pail. 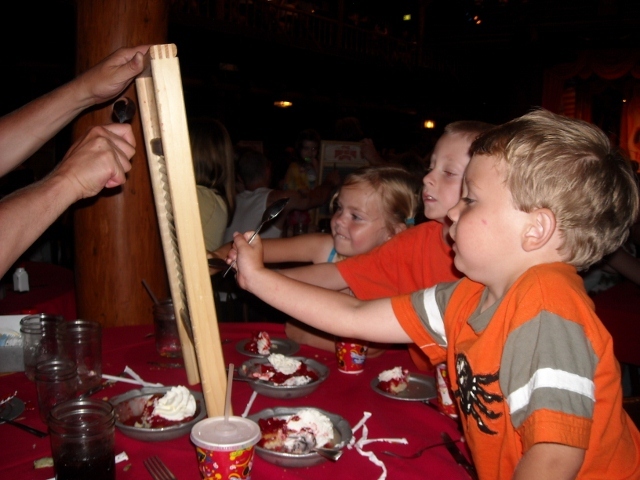 While the food is great and the service has always been phenomenal, the Hoop de Doo is spectacular because of the Pioneer Hall Players, the cast of 6 that entertain you while you eat. They sing, they dance, and they tell corny jokes. There is also a lot of audience participation – you get to “give a yell” and “stomp your feet” during the show. They also wander through the audience and ask things to incorporate into the show. The Pioneer Hall Players commemorate special occasions in a way that is uniquely Hoop-de-Doo. It’s your anniversary, how about an anniversary dance right there while the Players serenade you? Recently we celebrated my son’s birthday there, all I know is he still talks about his “Tarzan yell” that the whole restaurant heard. The end of the show allows you to get even louder, washboards are handed out and you are encouraged to play your washboard. It is definitely loud with lots of clanging, clacking, and laughing. My favorite part is the energy of the show. After a long day in the parks we have arrived with kids that are about ready to fall asleep in their dinner but as soon as those door start shaking, announcing the arrival of the Players, we are all wide awake and ready to play along. This show is great for all ages and while it might get noisy, the bigger danger is that your cheeks will hurt from laughing and smiling, I know mine always do. For the Adults in our family, the TUSKER HOUSE was a surprise favorite! It was a nice place to sit down and have a bountiful meal in the middle of a hot, active day at Animal Kingdom. My husband, who is a total meat, rice and potatoes guy, loved the quality and quantity that this Buffet had to offer. My mother-in-law and I were in paradise with the plentiful salads and great choices of food fare from around the world. My daughter… well she enjoyed her peanut butter and jelly sandwich. We went at lunch which, at the time, did not have a character meal. The Tusker House now has character meals for both breakfast and lunch. I think my daughter would have loved it more if there were characters there. However, it was great and it was one of the restaurants my Husband mentioned to visit again when we go back to Walt Disney World. See our fun photos, waiting to be seated. “BOB” the host was so awesome and personable, as you can tell from our interaction with him. Great food, great service, in a casual atmosphere! Loved the TUSKER HOUSE. Next up on our journey of favorite restaurants is one of the premier restaurants in all of Walt Disney World: Le Cellier! A favorite of my friend Deb from Focused on the Magic, she wrote a blog post on her site about a time she ate there. Click on the picture to head to the post! Having the reputation for marching to the beat of my own cupcake, I’m going to bypass any real restaurant and get my meal at the Candy Cauldron at Downtown Disney. $4.95 is no bargain, as far as snacks go, but this Turkey Leg snack doesn’t carry the greasy residue the real turkey leg has, or the $9.95 price tag. And I can eat it on a bench overlooking the lake across from the Saratoga Springs resort, Disney music in my ears from the speakers hidden in the bushes, and the sound of children’s laughter ringing in my ears. That’s my kinda Disney meal! 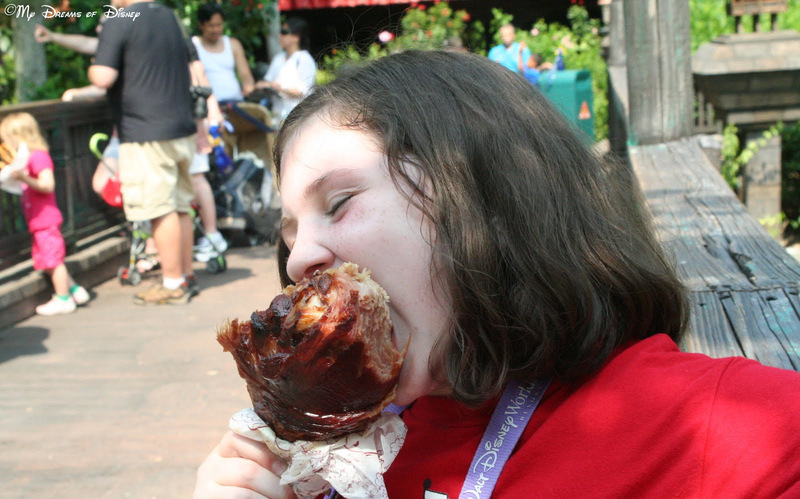 So, while that turkey leg certainly is interesting, I’m sorry Amanda, but nothing compares to this Jumbo Turkey Leg that Sophie is enjoying! Thanks for stopping by everyone! 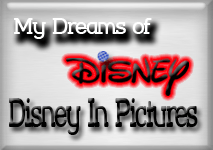 Next week’s edition will be postponed because of Easter, so we’ll see you in two weeks for Disney in Pictures!